Video games are expensive compared to other hobbies—but they don’t have to be! Here’s how to game on a budget. At first, it can appear difficult to get games on the cheap. If you’re into television, you can subscribe to a service like Netflix for the price of two big-budget games per year. Enjoy reading or comics? Amazon Prime or your local library have you covered. Want to go to the movies? Check out Movie Pass. Music lovers have everything from Spotify to YouTube at their fingertips. But for video games, the solutions are less obvious. The most important thing you can do when buying games on a budget is think ahead. I have some friends who insist that buying games and trading them in is the cheapest way to play games. Is that true? Sure, I could go to my local Gamestop, purchase the latest AAA game for $60, play it for a month, and trade it back in for $30, but that just means I’ve essentially rented the game for $30. Is that worthwhile? It might be marginally cheaper than the $2 a day it costs to rent games from Redbox, and it’s more reliable than Gamefly, but it’s still pricey. The absolute least expensive way to play video games is to be patient. Sure, that big new game might cost $60 at launch, but give it a month or two and you might see stores clearing them out for $40 or even $20. If you’re willing to wait several years, you’re likely to find it for $5 or $10. If you’re lucky, you might not have to be that patient; your local library will have some games to rent. Then there’s Gamefly, which will let you rent a single game at a time for $16 a month. These are probably cheaper now. None of these are great options. Sure, by waiting, I picked up FROM Software’s Chromehounds last year for less than $3 instead of the $60 it would have been new, but the servers are long dead, and Chromehounds is predominantly a multiplayer game. Few library systems offer video games, so it’s not a reliable resource. Gamefly’s $16 a month is questionably pricey, considering you only get one game at a time and aren’t guaranteed to get the game you want when you want it. Just because something seems inexpensive doesn’t mean it’s the best way to play new games. We can do a lot better. The best way to play games on a budget is to convert to PC gaming, full time. It always has been the least expensive way, and it likely always will be. Some people argue that a PC costs more than a game console, and it’s true; a solid gaming PC should run you around $1,000, which is more than a $300 console. Over the long term, the opportunities to save money on PC gaming is so much greater than any other platform, thanks to frequent sales, bundles, and overall PC gaming costs. Retailers like WinGameStore, Gamersgate, and Cdkeys often sell games for less than you might expect to pay on Steam. Consider Final Fantasy XV, which cost players $60 at launch. If you wanted all the content Square Enix planned to release for the game, you’d have to shell out $85 for the game and season pass, or $90 for the deluxe edition (which doesn’t include the season pass, but does include some other DLC). PC players can play the Windows Edition, which includes all the DLC content, for just $50. That’s a lot better than spending $90 and not even getting the season pass. As a general rule of thumb, buying games for the PC costs less and includes more. Computer gaming has a few other advantages as well. Many graphics cards include codes for free copies of big, recent games, and occasionally retailers like Newegg will dump them. Or customers who don’t care about the games will sell the codes for cheap on eBay. Alien: Isolation and Metro: Last Light cost me a dollar. I picked up Thief months before its release for $6. Dirt Rally cost me $5. Retailers like WinGameStore, Gamersgate, and Cdkeys often sell games for less than you might expect to pay on Steam. Be watchful for illegitimate sites selling stolen keys. You shouldn’t support them as a matter of principle—it harms developers and makes it more difficult for them to make additional games—and developers can cancel those keys, which means that it’s possible to buy a game, discover that it doesn’t work, and have no way of getting your money back. If you haven’t heard of a game reseller before, a quick Google search should help you determine if they’re legitimate or not. One great way of saving money on games is to participate in loyalty programs. Microsoft Rewards is decent. You can get points for performing various tasks like searching daily with Bing and purchasing items from the Microsoft Store. It’s a nice way to pick up the occasional game or top up on a few months of Xbox Live. Nintendo has a rewards program too, but the rewards aren’t really worth it. Sony doesn’t have a rewards program, but does occasionally email codes to people who have signed up for their emails. 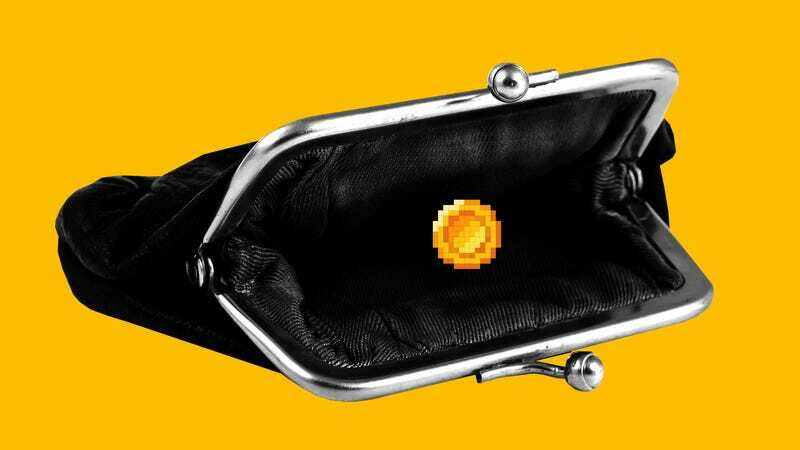 Best Buy, GameStop, and Amazon used to have loyalty programs like Gamer’s Club Unlocked that would either give players some percentage off of new games, or a kickback in the form of a gift card. These days, big box retailers might offer you a $10 gift card for purchasing specific games. For the budget-minded gamer, PC gaming is still the the best, most reliable way to play games inexpensively, and for PC games, there’s nothing better than the Humble store. Not only does it feature frequent sales, it also offers a discount for Humble Monthly subscribers and cash back on Humble store purchases. I recently re-upped my yearly sub for Humble Monthly, which means I got $20 to spend on the Humble store. That $20, combined with a preorder discount, my 10 percent subscriber discount, and five percent cash back, meant that I was able to purchase Final Fantasy XII for about $15 when it normally sells for $50, and now I’ve got $2 to spend on my next purchase. Humble also includes referral codes for the monthly service; refer a friend to Humble Monthly, and you earn $8 in store credit. It seems like subscriptions are the business model of the future. Want to stream movies and television digitally? There’s Netflix, Amazon Prime, and a bunch of other services for that. Heck, you could even try Hulu if you were desperate. Video games are a different story. First, you’ve got the lag issue; in a world where competitive gamers hook their consoles up to computer monitors to get a few-millisecond edge over a television, the lag introduced by game streaming is going to be a barrier to pretty much any kind of real-time gaming. Will the pixel-perfect necessities of Bloodborne feel right to players who are hours away from the nearest data center? Probably not. If that weren’t enough, you’ve got to consider data caps. I left some streams on overnight a few months ago, and in so doing, blew right through my data cap. Cox, my internet service provider, charged me an extra $70 for doing so. For unlimited data, I have to nearly double my internet bill, adding another $50 a month. Don’t think about trying to ration your internet traffic. In my experience, Cox doesn’t reliably report how much traffic you’ve used, so there’s no way to be sure other than buying your own router and constantly checking how much traffic you’ve used. Microsoft is introducing a new service, xCloud, in 2019. We could get into a whole thing about how internet service providers don’t need to charge you for extra data and how scummy it is, but at the end of the day, right here, right now, if you want to stream games, you’re going to have to pay a pretty premium to do so. Sure, if you buy one $60 game a month, you’re spending $720 a year on games, but if you’re paying $50 a month for unlimited data and $10 a month for a streaming service, you’re literally paying the exact same amount, except this time, you don’t even own the games you pay for. Right now, there are two major streaming services available. Nvidia’s GeForce Now service is currently in a free beta, and it, uniquely, lets you play games you already own on other services like Steam and Uplay. This is great because it means you can buy a game on a platform of your choosing at the price you want and play it on any compatible device, rather than paying for a limited subscription. The biggest problem is the price; at $25 for 20 hours of gameplay, GeForce Now is absurdly expensive. Sony offers a less expensive service, Playstation Now, for $20 a month, but with several caveats. First, you’re only playing PlayStation games, which means your library is dramatically smaller than what GeForce Now offers. You can download some of those games to your local PS4, but you’ll never own them: you have to perform constant online check-ins to make sure you’re still subscribed to the service. With Now, you run into all the traditional issues of a streaming service, but there’s a free trial you can use to test if it’s good enough for you. Microsoft is introducing a new service, xCloud, in 2019. They claim it will solve some of the technological problems that streaming services face, and their in-home streaming Xbox-to-PC tech seems like a neat proof of concept. But we don’t know anything about what it will cost, what games you can play, or whether it will be tied to existing services. Google is planning a similar service, and Amazon may be next. Ultimately, if you want to game on a budget, I wouldn’t recommend any of these services unless American internet infrastructure changes radically. Some services let players download games instead of stream them. Right now, for $60 a year, PlayStation 4 gamers who subscribe to PlayStation Plus receive six games a month, selected by Sony. That sounds great, but Plus has several drawbacks. The game quality is rarely that good because Sony tends to release games only once they’ve hit the bargain bin; the not-that-great Knack, for instance, waited almost five years to come to the service. If you cancel Plus, you lose access to the games, so they’re not yours to keep, and it can be hard to remember which games you own and which games you acquired through Plus. Fortunately, if you resubscribe, you regain access to those games. PlayStation Plus includes two free PS4 games a month. Worse still, most of the games you’re getting are for the PS3 and Vita, not the PS4. Some of the PS4 games require you to own a $300-$450 PSVR bundle too. That’s a lot of hardware; if you only have a PS4 console, Plus isn’t a that great of a deal. Sony will be reducing the number of Plus games available in the near future. Once it stops distributing PS3 and Vita games, Plus subscribers will only receive two free PS4 games per month. Perhaps the biggest advantage to Plus is the inclusion of additional savings on digital games in the Playstation Store. Let’s say you find a $15 game for 20 percent off through Plus. This means that it costs $11.99 instead of $14.99. If you wanted to make Plus pay for itself, you would have to buy 20 similarly-priced games, which amounts to around $240. Is that worth it? If you have a PS3, a PS4, a Vita, PSVR, and a lot of time on your hands, the free games offered by Plus aren’t that bad, but how many people have and use all four devices regularly? Are two games a month really worth it for people who only own a PS4? Nintendo has recently entered the fray with Switch Online, a bizarre service that offers an expanding library of Nintendo Entertainment System games that require you to check in online once a week in order to play them. None of these games are even close to recent. Where Microsoft and Sony offer a mix of current and last-gen offerings, the three Switch Online library consists of games from three decades ago. It looks like Nintendo will end the year with 29 NES games included with its system. When you get a 360 game through Gold, that game is yours to keep. Microsoft offers a similar service, Games with Gold, as part of its Xbox Live Gold program. Gold offers four games a month, two for Xbox One and two for Xbox 360, but it’s a dramatically better proposition than Plus. First, the Xbox One has a robust backward compatibility program. Every Xbox 360 game that Microsoft releases with Games With Gold is guaranteed to be backward compatible for the Xbox One. You will always get four games a month, and those four games will always be playable on an Xbox One. Most of the games in the program are games that retailed for $60 on release, so they tend to be bigger, more desirable games than what Plus offers. Better still, when you get a 360 game through Gold, that game is yours to keep; if you cancel Gold, you don’t lose access to the games, which makes it a much better investment than Playstation Plus. Unfortunately, Xbox One game access is lost if you cancel your subscription, but like Plus, you can regain access to those games when you re-subscribe, so they won’t be lost forever. The Gold-exclusive discounts are usually great, sometimes up to 70 percent off for big AAA games. Microsoft has a new sale with deep discounts every week. Nintendo Switch Online lets you play a library of NES games, with games from other platforms coming in the future. Xbox Live Gold isn’t the only subscription program available to gamers. There’s EA Access, which gives you access to an impressive library of EA games that you can download and play at any time as well as time-limited trial versions of new EA releases. Because of Microsoft’s great backward compatibility support, subscribers get to play Xbox 360 games like Mass Effect 3 and original Xbox games like Black. This program isn’t available on the PlayStation, but PC Gamers can subscribe to a similar program, Origin Access, on the PC, though some games, like the console exclusive shooter Black, aren’t available. Origin Access has over 160 games, and unlike EA Access, it features a lot of non-EA games, like Tyranny, Batman: Arkham Origins, and Mad Max. Both of these EA subscriptions cost $5 a month or $30 a year, and they offer a 10 percent discount for any EA games you might want to purchase permanently. EA has also introduced Origin Premier Access, which costs $15 a month or $100 a year, includes three more games than regular Origin Access, and offers a 10 percent discount on Origin. It also includes unique content for every new EA game, but that’s probably not worth it. Battlefield V’s Premier Access content is a new outfit and a knife. FIFA 19 lets you pick one top-rated player to add to your team. Madden gives you 50,000 coins. It’s not a compelling deal. Perhaps the best thing about the Xbox though is the Xbox Game Pass, a program that gives players access to more than 250 games every month, up from just over 100 on launch. It’s pricier than EA Access, at $10 a month, or $120 a year, but with more than quadruple the games from the original Xbox to the Xbox One and a 20 percent discount for games you want to keep and up to 10 percent discount on downloadable content for those games, it’s a fantastic deal. Game Pass costs as much as Netflix and offers a huge library of games and discounts, but the real advantage to subscribing is this: all future Microsoft-published Xbox exclusives will be released, day one, on Game Pass. Want Sea of Thieves? Cool, you could spend $60 on it or just play it as part of your game sub. Better yet, if the game is a Play Anywhere title, you can play it on your PC as well as your Xbox. If you’re a die-hard console gamer, Microsoft is absolutely killing it when it comes to subscription services. But if you want to save money and have a gaming PC, there’s a better deal, and that’s Humble Monthly. Humble Monthly is a bit different. Like the console subscriptions, Monthly gives you access to discounts, but the discount is only 10%; Monthly subscribers also get cash back on every store purchase, which is pretty cool. What makes Humble Monthly special is the way it handles games. Humble Monthly gives players Steam keys, which means that you get to keep any of its games forever. Even better, if you get a key for a game you don’t want, you can give it away to your friends or even trade with them for keys you might want. You also get access to the Humble Trove, a collection of DRM-free games that you can download and play at any time without having to use Steam. I mistakenly gave away my Steam key for the enjoyably infuriating Getting Over It With Bennett Foddy, but I can still play it thanks to Humble Trove. Some people hesitate because paying for a Humble Monthly means going in blind. It works like this: you pay $12, and on the first Friday of the next month, the entire bundle is revealed. The only game title you know about is the early unlock. In January, the early unlock was Civilization VI, which has never sold for lower than $30 on Steam, and it included two DLCs, which, combined cost another $10. Getting those for $12 instead of $40 is an incredible savings. Xbox Game Pass is a library of games available for a monthly fee. Then, when the rest of the bundle unlocked, players gained access to seven more games, including amazing games like Snake Pass, Owlboy, and Life is Strange. Monthly subs also give players “Humble Originals” every month; these are cool, experimental games that are launched exclusively for Humble, though they often get Steam keys at a later date, which lets you add them to Steam. Humble Monthly costs more than the competition, but the quality of the games in Humble Bundle is easily the best out there. There’s always at least one or two big-budget games and a few notable indie game. It can be risky, and there have been a couple months where I didn’t like or want many of the games available, but it’s the best subscription plan available. I may cancel my Xbox and PlayStation subs, but I doubt I’ll ever stop being a customer of Humble Monthly. Let’s say you’re not big into subscription services. What other options are available? Humble didn’t start out as a monthly subscription. It was the first major indie game bundle site out there. Right now, it works like this: every bundle has three tiers: the dollar tier, with the fewest games, the “beat the average” tier, and the top tier, which offers the most games. Humble bundles usually run two weeks, adding additional games to the “beat the average” tier after the first week. Humble is still the most reliable, trustworthy bundle site out there, and it routinely offers awesome games for players. Occasionally, it will offer bundles with PlayStation codes, but for the most part, it’s a place for computer games. Other bundle sites include Fanatical and Groupees. These sites tend to offer smaller bundles for less than Humble, and a lot of it is low-demand stuff, but I’ve found plenty of fun games in the bundles regardless. I used to buy every bundle I came across, but as a more budget-minded gamer, I only buy bundles if they include at least one game I really want. They’re usually $3-5, so it’s a great savings on that one game. A lot of these sites are attempting to become stores of their own, offering games for Steam with pretty great discounts. I’ve encountered a few sites over the years that offer single game sales. The best one is probably Chrono.gg, which features a new game every day. A great way to keep up on these deals is to browse subreddits like /r/gamebundles and /r/gamedeals. Twitter accounts like Wario64 and Cheapass Gamer are great ways to keep an eye out for great deals. Deals aren’t the only way to save on buying games. I sell Steam trading cards on the marketplace—they’re free, pointless items you get for simply playing games on Steam. To speed up the process, I use a program called Idlemaster, which makes it seem like I’m playing Steam games without me actually having to run them manually. Fortnite developer Epic has just launched its own new game store. While there aren’t many games on it yet, the store offers a free game every two weeks, starting with Subnautica and Super Meat Boy. These aren’t the newest games, but they are critically acclaimed; Epic has set the bar pretty high. If they can keep this pace up, customers using their store should have 26 games in their library by this time next year. Valve and Microsoft have generous refund policies, but in my own experience, Sony refuses to honor refund requests for preorders. Steam used to be a great way to get games inexpensively, but sites like Humble Monthly do it better. I wouldn’t recommend participating in Steam sales without using a price tracker like IsThereAnyDeal. Some publishers resort to price hikes right before a Steam sale to make it seem like they’re offering better deals than they are, but Steam is rarely the best place to buy games; it’s so much easier to buy Steam keys on other platforms and unlock them on Steam. It’s wise to be careful who you spend money with. Valve and Microsoft have generous refund policies; I once bought a game on the wrong card and Microsoft quickly helped me cancel my purchase and offered me a refund. Valve will refund you for games purchased from its store, but most key retailers can’t offer you the same courtesy, because they have no way of recovering the key once you have it. I’ve seen numerous complaints about dealing with Sony for refunds or corrections on charges. In my own experience, Sony refuses to honor refund requests for preorders. Once you give them money, they won’t part with it, and you may be stuck without your cash and the game they haven’t even delivered to you. The best thing to do is make a list of the games you want, stick to that list as best you can, pick a price point you’re willing to buy the game at and only buy it if it drops below that figure, and only buy a new game when you’ve finished at least one game in your collection. Do you really need to buy a hundred games that you don’t have the time to play? Probably not. If you want to save money with a console, go Xbox and pick up a Game Pass subscription. If you want to play games at their absolute cheapest, convert to PC gaming full-time. GB Burford is a freelance journalist and indie game developer who just can’t get enough of exploring why games work. You can reach him on Twitter at @ForgetAmnesia or on his blog. You can support him and even suggest games to write about over at his Patreon.